Though you can probably tell I take most of my reading pretty seriously, it's fun to lighten up a little every now and then. 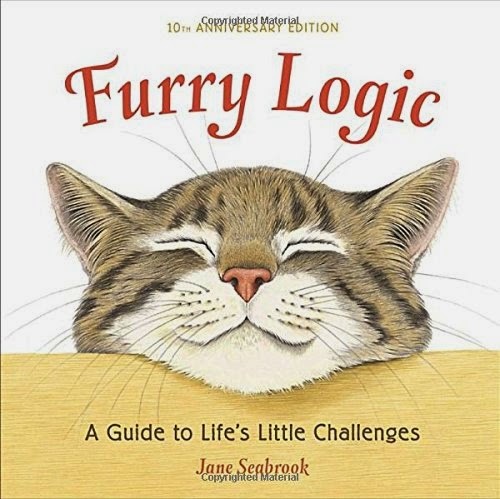 The 10th Anniversary Edition of Jane Seabrook's Furry Logic: A Guide to Life's Little Challenges, provides me with a great opportunity to indulge my love for cute critters, expertly painted in watercolors. Each meticulous painting is paired with a playful quip that encourages readers to poke fun at themselves, take the easy road, or revel in their own misbehavior. Seabrook shares in her Artist's Note that she creates her wildlife portraits using (and wearing out) fine sable brushes with a single hair at the tip to capture the most delicate hairs and feathers. The level of detail makes each painting a visual treat. The book's diminutive size gives each image a jewel-box quality, but also belies the overstated personalities inside. Her collection of critters, often tightly framed, take on anthropomorphic sentiments when paired with humorous quotes. I especially got a kick out of a close up of a lone crested penguin who lifts a flipper to say "Always remember you are unique..." A page later, the artist zooms out to reveal the creature among a train of equally chipper crested penguins and completes the sentence: "just like everyone else." I was curious to learn more about the meerkats and pilileated woodpeckers depicted in the book, but while Seabrook employs a diverse cast characters, she doesn't provide information on the species that have inspired her paintings. While this information would have distracted from the impact of the quotes if added to each picture, I thought the Artist's Note at the end of the book would have been an ideal spot to share more about the critters in the book and whether she painted from memory, photographs or real-life models. This simple little book is a perfect gift for those with a wry sense of humor and a love for animals. Science-minded readers can enjoy the level of accuracy found in each painting, though they won't find factual information to satisfy the left brain. However, visual minds will love the winsome artistry, and wordsmiths might find some new quotes to add to their repertoires.